Since 2012, October 11th has been a day to draw attention to the issues and challenges girls around the world face, while at the same time, empowering them to reach their fullest potential. #DayOfTheGirl is everything I stand for, you can see why it’s one of my favourite days of the year. 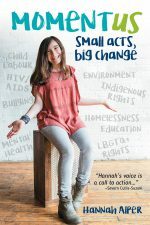 This year, I honour this day by sharing an excerpt from my book, Momentus: Small Acts, Big Change which will be in stores on November 1st, 2017. Momentus is filled with the stories, experiences and advice of 19 role models that have created big change in their communities and our world. Severn Cullis-Suzuki is the first person that I interviewed for my book. She was my first role model and she is the first piece of my book that I am honoured to share with you. I was nine years old and two months into blogging when my mom called me downstairs to watch a video. She didn’t say anything; she just played the video. Severn Cullis-Suzuki was sharing a story about how, at four years old, she had filled her wagon with her stuffed animals and walked around her neighbourhood telling people she wanted to save the animals. Severn was learning about the environmental issues animals faced and was sad and worried. I totally related. That was the moment for me. I realized I wasn’t alone in this. It was also the moment I realized young people can make a difference, and adults will listen. 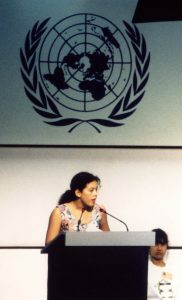 Young people can change the world. I could change the world. So Severn was at the top of my list of role models to feature [in my book] and I’m so honoured to introduce her to you as the first interview. Please meet my first role model, Severn Cullis Suzuki. One thing Severn and I have in common is our belief in the power of young people. Severn believes children and youth see and speak the truth in a way nobody else can. I agree. Through my travels, I have met and connected with so many young people who are passionate about a variety of issues and speak out about them. It shows adults that we do care about things that are going on locally and globally, that we’re not always on a camera taking selfies. We have a voice, we want to use it and we do use it…a lot. One of the things I talk about is that we can use the Internet and social media to make a difference. We live in an amazing time with tools and resources to amplify our voices. I asked Severn how being a youth activist 25 years ago is different than being one today. Severn said the only way she found out about other people’s efforts was through word-of-mouth and from her environmental activist parents, David Suzuki and Tara Cullis. Severn said the Internet has given young people a platform. My blog has allowed me to connect and share with people from all over the world. I can’t imagine not having an online community. And because of social media, Severn’s 1992 video went viral and I watched it and set me on my path. One line hits me especially hard. When talking about the harm people have done to the environment, she pleads, “If you don’t know how to fix it, please stop breaking it.” Those words are so powerful to me. I asked Severn if she thought we’ve made progress in helping to protect the earth. She said it was a tough question. It was a relief to hear that word: “hopeful”. Knowing she has hope helps me stay positive and motivated to continue to make change. In fact, Severn thinks there’s never been a better time for radical change. Severn is saying that we need to use what we are good at to make a difference. I’m pretty sure that sounds familiar. Issue + Gift = Change. Right? And then she takes it further by adding that it takes all of us. Momentus, small acts, big change. If you’re afraid that people won’t listen, keep talking. People listened to Severn, and now look where she is. She was only 12 years old when she became known as “The Girl Who Silenced the World for 5 Minutes”. Today, inspired by Severn, I use my voice to make change, and so do many others. 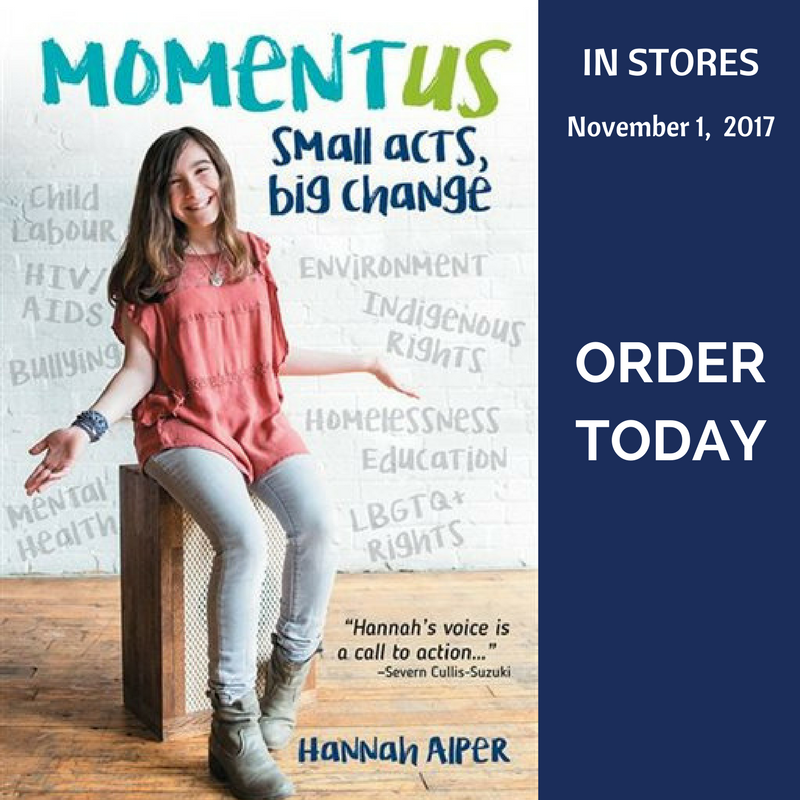 My book, Momentus: Small Acts, Big Change is available for pre-order here and will be in stores on November 1st 2017.